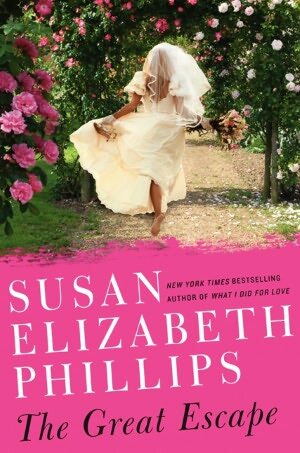 This is the first novel I have read by Susan Elizabeth Phillips, so I can tell you that it doesn't matter if you've read her past works as you move forward into The Great Escape. You don't have to know the characters from other stories to enjoy this piece of work as it easily stands alone. The Great Escape is the story of Lucy Jorik, runaway bride, who finds herself itching on the morning of her wedding day. Itching to get out of the perfect relationship with the perfect man. Her husband-to-be is incredible. Amazing. And too perfect. Lucy's life as the daughter of the former president of the United States has her in the public eye. Her wedding is under constant watch, as is she. So when she heads out of that church in a choir robe and runs smack into Panda, a grimacing biker dude, why wouldn't she run straight TO him? Right. And so she does. Panda is an interesting *name* for this character. I kind of hated it, but I could still tell he was hot. Phillips' use of detail and description for him makes me, as the reader, find him slightly intriguing and slightly repulsive. But I'm figuring that Lucy sees him, SEES his hotness and sees him as an escape and so she hops on his bike and heads far from the perfect life. Is some of this story wrapped up in a neat little bow at the end? Sure. Most novels are - aren't they? Were there some surprises along the way that made me want to keep reading? Yep - definitely. I finished it, didn't I? Let's just say that Panda is more than meets the eye, and Lucy finds a way to get beneath that gruff exterior. Does she stay there? Does she return home to find her not-quite-husband waiting for her? Does she reach out to her parents? Siblings? Best friend? Where is Lucy headed? Will Panda stick around for the ride? Hopefully these questions are enough to get you interested. It was a light and easy read and would be perfect for you to toss into your bag before you head out to the beach or pool.